Evenings can be a really hard time when you're trying to establish healthy eating habits. It's relatively easy to build healthy meals through the day, but what about at night when you're sitting in front of the TV? Indulge yourself in one or two of the wrong snacks, and you can take in a ridiculous number of extra calories. 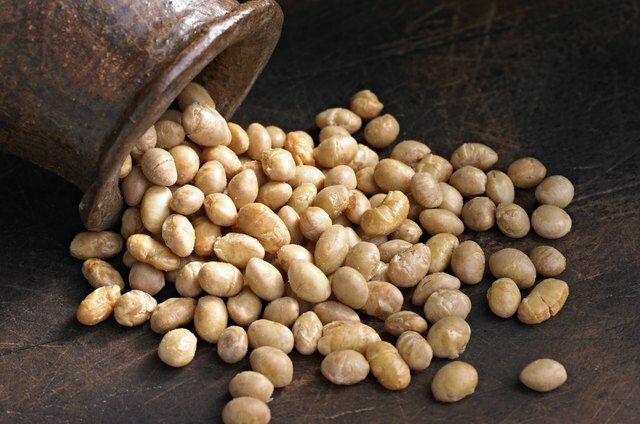 Roasted soybeans, or soy nuts, are one relatively healthy way to deal with a craving for something salty and crunchy. You can buy them already made up in a bag, but it's easy to make your own at home and avoid any additives or preservatives. The most traditional way of making roasted soybeans starts with the dry beans. Pick out any broken beans and give them a good rinse, then soak them overnight. The next day, drain your beans thoroughly and roll them around on a clean kitchen towel to remove any excess moisture. Spread the beans on a parchment-lined sheet pan and spray them lightly with cooking oil, and a sprinkle of salt if you want. 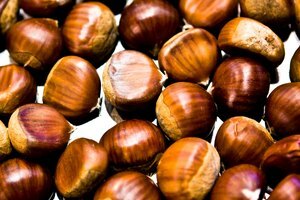 You can roast them at any temperature between 300 and 350 degrees Fahrenheit, depending on how impatient you are and how much attention you can spare. At 300 degrees, they'll probably take an hour or so, but with little risk of scorching. At 350 degrees, they'll take only about half as long, but you'll need to watch them closely during the last few minutes. Either way, you'll need to stir them periodically for even cooking. If you don't want to heat up your whole kitchen with the oven, but do have an electric frying pan, you can use that instead, for small batches of soybeans. Spray the electric skillet lightly with pan spray, heat it to 350 degrees, and then add a cup or two of soaked and dried soybeans. Cook them in the nearly-dry pan for 40 to 50 minutes, stirring them frequently, until they're crunchy, golden and aromatic. If you're really impatient and can't wait to have your snack, you can do small batches of up to a cup in your microwave. Start by spreading out your beans on a microwave-safe glass or ceramic pie plate, and microwave them on the high setting for six minutes. Give them a good stir, and then another three minutes. Stir them again, and then microwave them for a minute at a time – stirring them after each zap – until they're evenly golden-brown and crunchy. It should take a total of 12 to 15 minutes at most, depending on your microwave. If you live in an area where it's hard to find dry soybeans and don't want to order a whole bag online just to try a new snack, you can roast edamame instead. They're immature soybeans meant to be eaten fresh, as a vegetable, and you can find them shelled in the frozen section of your supermarket if you can't get the whole fresh pods. Shell them if necessary, then spread them loosely on a parchment-lined sheet pan and sprinkle them with a bit of salt. Roast the beans until they're crunchy and golden, stirring regularly. They can take up to 90 minutes to fully roast, depending on their original moisture content, so be patient. Basic roasted soybeans need only a pinch of salt to be a tasty snack, but that doesn't mean you can't change things up occasionally and have some fun with them. You can toss the hot, freshly roasted beans with any combination of spices and seasonings that appeals to you, from traditional spice blends like garam masala to your favorite barbecue rub.